Aims to achieve similar power reductions as Intel’s FinFET but will use bulk CMOS. During the IEDM conference in Washington, D.C. earlier today Fujitsu presented a paper jointly authored by SuVolta. The paper describes how a newly developed transistor with a deeply depleted channel can achieve the same power savings as those announced by Intel that has launched a FinFET-transistor, which the company calls a 3D transistor. From a customer point of view the most important difference is that the Intel transistor requires the same threshold voltage across all transistors, whereas it can be varied using the SuVolta planar transistor. Multiple threshold voltages are often required when fabbing SoC’s and are therefore more suitable for foundries than the FinFET implementation. Also, implementation of FinFET’s outside the domain of Intel are several years away and is not expected until Foundries reach the 14nm node. From a manufacturing point of view it is much simpler to fab the planar transistor as it is fabbed in a conventional CMOS process using bulk CMOS without the need for tricks like SiGe to strain the silicon. In the illustration below you can see the actual detail of a single transistor and the various layers in the transistor. 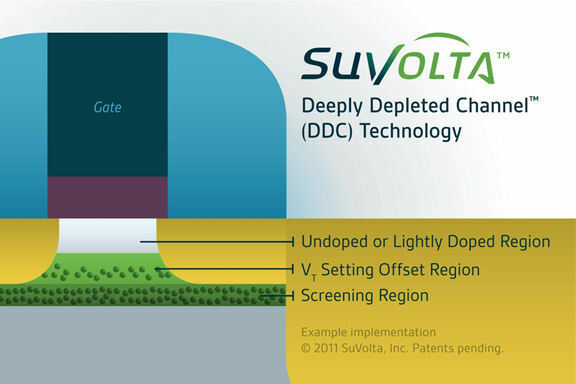 SuVolta's Deepkly Depleted Channel Planar Trnasistor. /copyright SuVolta. Updated: December 8, 2011 12pm. Correction to location of IEDM conference.